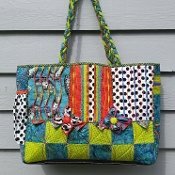 Are you ready to put your Babylock serger to work making a sampler tote? In this 5-week class we will use decorative threads and a variety of embellishment techniques developed by Deb Canham and Jennie Rayment. This class is intended for intermediate to advanced serger owners of Babylock Evolution, Ovation and Triumph machines.